The Core-Lokt lineup is known for having rounds available in a variety of calibers, designs made for a multitude of game animals, and they are available in a massive plethora of configurations. The defining features of Core-Lokt ammunition is the high-quality brass primed with the dependable Remington primers, the most reliable controlled expansion bullet on the market, and Remington’s famous smokeless powder types. 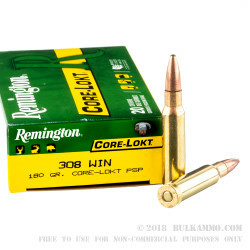 These Remington Core-Lokt .308 rounds have a heavy weight 180 grain, Pointed Soft Point or PSP lead core bullet with a heavy-duty thick copper jacket that covers every part of the bullet except the tip. The soft pointed lead tip and core are mechanically locked to the jacket. These features provide the shooter with a consistent projectile that expands each and every time it's used on the hunt. When it expands, it retains almost all of its mass causing a significant wound to the animal you are hunting. 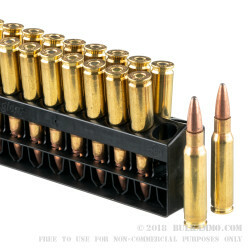 Each of these Core-Lokt Bullets are set into a new, thick walled, heavy-duty, Boxer primed, non-corrosive, reloadable, polished, yellow brass case. 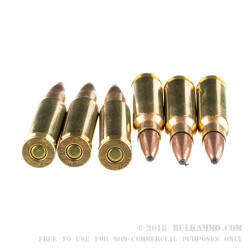 These cartridges are reported to have a muzzle energy that hits at 2743-foot pounds, a Ballistic co-efficient of 0.383, and its muzzle velocity is an impressive 2,620-feet per second. These .308's are ready to go whenever and where ever you are. 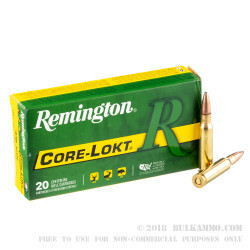 These come in the famous Remington 20 round Core-Lokt yellow-green boxes, and there are 10 boxes per case... giving you a total of 200 rounds.